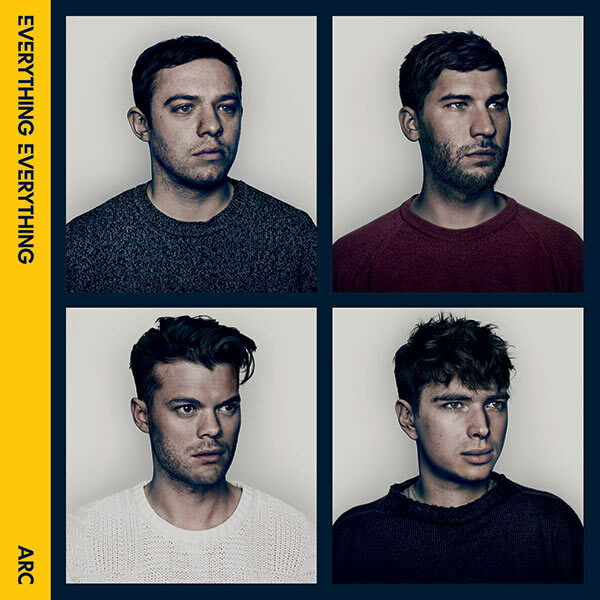 It’s a brand new year and the first record to grab AiA’s attention is the second album of mancunian art-poppers Everything Everything. Their 2010 debut, Man Alive, featured some of the most insane, and most brilliant songwriting and spawned a number of alt-radio insta-classics in ‘MY KZ, UR BF’ and ‘Schoolin”. Unfortunately they couldn’t sustain the genius/insanity balance across a whole album, but they were widely praised for creating a unique and innovative sound with their first record. No pressure then, for this follow-up… Fortunately most fears about what could go wrong were allayed by the fantastic first single, and also opening track, ‘Cough Cough’. It was so successful that last year it actually snuck into the top 40, an impressive feat for a band so experimental. But that of course, is where Everything Everything’s true genius has always been. While other bands like Django Django and fellow mancs Dutch Uncles seek the same sonic experimentation, EE have always had the pure songwriting chops to accompany their musical adventurism and it is on Arc that this songwriting gets it’s true showing. Let’s cut to the chase, this album has no ‘Photoshop Handsome’, EE have toned down some of their more insane moments and it is slightly dissapointing, but they haven’t abandoned their sound at all. Instead they’ve pushed it towards a more coherent model. The pop songs on Arc have more in common with Man Alive track ‘Final Form’ (no coincidence that was the last track released), while much of the album sees EE persuing ballads in the vein of Man Alive’s ‘NASA Is On Your Side’. This yields mixed results. There are only 5 tracks that could be considered the Art-Pop that made up the majority of their debut, the rest are all variants on this balladic form. Some, like the orchestral ‘Duet’ and ‘Choice Mountain’ seem to echo other bands, the former touches very close to Coldplay while the latter wouldn’t have gone awry on Alt-J’s debut Album. They’re good songs, certainly better than the troughs of Man Alive, but not quite as good as the heights hit by the pop singles of ‘Cough Cough’ and latest release ‘Kemosabe’, whose nutty lyrics will satisfy long term EE fans. However where this album really earns its stripes, and where it deserves to be called an improvement on their debut is when their ballads work. ‘Feet for Hands’ and ‘The House Is Dust’ are good, but ‘Radiant’, ‘Undrowned’ and ‘The Peaks’ are just majestic. With atmosphere’s that build beautifully to explode and unleash a torrent of musical awe, these songs rapidly became my favourites on the album, and earns Everything Everything their new direction. These ballads have a stronger permanency than the singles, however brilliant and mad, and canm have a much stronger emotional impact, even if they don’t give you that earworm of a whistly hook that ‘Schoolin” did. The overarching theme of the record is some sort of technological apocalypse, picking off perhaps where Photoshop Handsome left off. ‘Undrowned’ sees frontman Jonathon Higgs’ trademark rapid-fire falsetto vocals deliver some deceptively relevant lyrics about modern Britain, only to close in an echo of Radiohead’s cult favourite ‘True Love Waits’, with a earnest plea of ‘Don’t leave’. ‘Radiant’ brings in enough of the art-pop to allow it’s monstrous nerdy cry of ‘I see a geiger counter / I see a richter scale’ to be genuinely terrifying, let alone it’s despairing chorus of ‘Go! Leave your homes! Take whatever you can! It’s no joke! It’s coming towards you.’ and just as the song fades Higgs drops in the line ‘I can make a difference so easy / I could make a difference but I don’t / Darling, I’m closing.’ It’s left to following track ‘The Peaks’ to gather it together, but all we get is what reads like a deity looking at the collapse of civilisation ‘And I’ve seen more villages burn than animals born / I’ve seen more towers come down than children grow up’, a couplet which twists in an even more horrific plea towards the song’s close. Why one of Britains most forward looking bands is so terrified of the future we’ll never know, although it should be mentioned that the undertones of ‘Cough Cough’, with it’s video footage of the London riots, might’ve been about some large impending doom to our society: ‘There’s something wrong but it’s okay if we’re still getting paid’. And now they’re proving why I’ve been so intently calling this band Art-pop. You don’t have to think about these songs to enjoy them. The cries of ‘Yeah! So, Um? Wait a second!’ are catchy and fantastically fun (even though ‘Duet’ apes Coldplay, there’s no way Chris Martin would ever sing a line like ‘and of all the dead vocanoes on earth you just happened to retch and roll through mine’) and musically they’re just astounding to listen to, but these songs all carry some sort of emotional and intellectual weight too. It’s one of the hardest tricks to pull off but it’s the reason Everything Everything are so good and the reason this album works so well. However, the album isn’t without it’s flaws. It’s a great shame that the title track is so transient. It would work better if it’s brief hook was more memorable, but it doesn’t quite have the effect it could which seems a missed opportunity, especially as giving it your album title makes listeners more keen to have it as the crux of the record. The record will never get a perfect score because only half the ballads are mind-blowing, the rest are merely average, which makes it all the more frustrating so few true pop songs make it on and that the three best of those all come right at the start. But by far the most frustrating thing is that the final song, ‘Don’t Try’, admittedly a great song, wastes the chance to have the sublime ‘The Peaks’ as the album closer. There would be few things more magnificent than having the last sounds on the album Higgs’ cry of ‘Tell me that my world is gone’. It’s so annoying to feel fully sated by an album, only to have a song pop up and ruin the perfect calm, although I can understand if Higgs and Co. wanted a slightly more upbeat ending, but if ‘Don’t Try’ had been slotted in around the equally good ‘Amourland’ it would definitely improve the overall feel of the record. Even without that change, it’s still a fantastic album, with some great emotional moments, but beyond that it’s also one of the most purely fun records I’ve heard in the last few years. I’ll leave you with what is probably the most fun song on Arc, ‘Torso Of The Week’, a wry look at our fitness obsession with a brilliant chorus.